Salem, Massachusetts may be known as the Halloween capital of the country, but a small Southern town is giving it a run for its money. Disclaimer: Some of the photos in the story's gallery are disturbing. WASHINGTON — Salem, Massachusetts may be known as the Halloween capital of the country, but a small Southern town is giving it a run for its money. Every year in October, residents of Clifton, Virginia retreat to the woods at the edge of town and wait patiently for more than 2,000 visitors to walk the park’s dark trail at nightfall. That’s because shortly after the sun goes down, the woods come to life with ghosts, ghouls and yes, clowns. “We have chainsaws and monsters jumping out of the darkness … We had a scene where a group of people were sitting around and feasting on someone’s head. And then we have all the usuals: We have the zombies and the vampires and the witches,” says Ester Pline, a Clifton resident. The Clifton Haunted Trail has been a town tradition since 2001, and over the years it’s grown from a small path lit by flashlights, to a production that involves 15 generators, more than 200 volunteers, 24 skits and months of advanced planning and preparation. “My whole house gets taken over by really creepy things leading up to the trail,” says Pline, who is the trail’s coordinator of creative activities. This year, she is spearheading two skits for the trail: one centered on the Salem witch trials and another involving velociraptors. “If the scenes aren’t scary enough, then we have this extra thing jumping out to get people,” she says. However, it’s not usually the case that the trail’s scenarios aren’t “scary enough.” Those involved see to it through elaborate costumes, props and sounds that they terrify all who walk past. “People in our community take great pride in their skits that they bring to the trail, so they’re very proud if they’re able to really scare somebody,” Pline adds. It takes about 35 minutes to walk the half-mile haunted trail, which is lit only by a few tiki torches. When visitors approach the trail, they are first greeted by an organist playing sinister tunes. But Pline says they don’t leave the trail on such a kitschy note. “We save our chainsaws for the end,” she says. 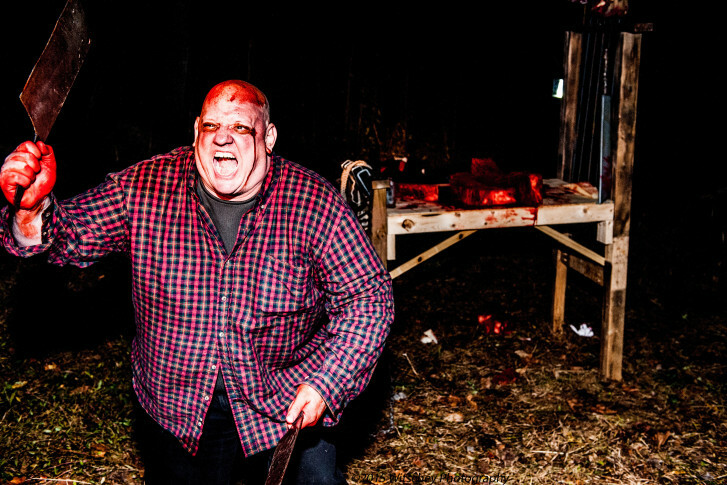 Trail-goers can also expect to see a sighting or two of the town’s own legend: The Bunny Man. It’s not just the Haunted Trail that’s put Clifton on the map for haunted happenings. Eric Hencken, who also volunteers on the trail, says last year a neighbor counted nearly 800 trick-or-treaters at his home on Halloween night. The Clifton Haunted Trail will take place on Saturday, Oct. 24 from 7 to 10 p.m. Tickets are available on the event’s website and at the door ($15 for adults, $10 for kids 12 and under). Prefer to let your friends go in alone while you wait in safety? Outside the trail, the town sets up bales of hay and plays Halloween movies on a big screen; vendors sell baked goods, pizza and barbecue. Hencken says the trail is truly scary, so he likes to leave it up to each parent’s discretion as far as who should attend (he gives it a PG-13 rating). But Pline says adults should definitely give it a try — even those who scare easily. “Those are the ones we like,” she says, with a twinkle in her eye.